Norman J.W. Goda is Braman Professor of Holocaust Studies at the University of Florida. His most recent book is Tales from Spandau: Nazi Criminals and the Cold War (2007), and is co-author of US Intelligence and the Nazis (2005). On January 22, 2010 Ukrainian President Viktor Yushchenko honored Stepan Bandera by posthumously bestowing on him the state honor, “Hero of Ukraine.” The Soviet KGB assassinated Bandera, a Ukrainian nationalist-in-exile, in 1959. Many Ukrainians, including Ukrainian émigré groups in Canada, pressed Yushchenko to grant the honor, which, according to one statement, "would restore justice and truth about the Bandera and the...struggle for liberation that he headed." To this day, many Ukrainians view Bandera as a martyred freedom fighter. As an uncompromising leader of the militant, terrorist branch of the Organization of Ukrainian Nationalists (OUN), Bandera became a Nazi collaborator who lived with his deputies under German protection after World War II began. In preparation for the attack on the USSR, the Nazis recruited Bandera’s followers to act as Ukrainian-speaking policemen and to serve in two Ukrainian volunteer army battalions. By working with the Nazis, Bandera hoped to free Ukraine from Soviet rule and establish his own government there. An independent Ukraine, Bandera promised, would remain friendly to Germany. Historian Karel Berkhoff, among others, has shown that Bandera, his deputies, and the Nazis shared a key obsession, namely the notion that the Jews in Ukraine were behind Communism and Stalinist imperialism and must be destroyed. “The Jews of the Soviet Union,” read a Banderist statement, “are the most loyal supporters of the Bolshevik Regime and the vanguard of Muscovite imperialism in the Ukraine.” When the Germans invaded the USSR in June 1941 and captured the East Galician capital of Lvov, Bandera’s lieutenants issued a declaration of independence in his name. They further promised to work closely with Hitler, then helped to launch a pogrom that killed four thousand Lvov Jews in a few days, using weapons ranging from guns to metal poles. “We will lay your heads at Hitler’s feet,” a Banderist pamphlet proclaimed to Ukrainian Jews. The Germans intended to keep Ukraine for themselves. They arrested Bandera for his intransigence on the issue of independence, but released him in 1944 when it appeared that his popularity with Ukrainians might help stem the Soviet advance. But whatever their disappointment with the Germans, the Banderists never disagreed with their Jewish policy in Ukraine, which eventually killed over 1.5 million Ukrainian Jews. This is a truth that many in Ukraine, particularly in its western parts, deny. In his book Erased (2007), Omer Bartov discusses the large bronze statue of Bandera that stands in a park in the east Galician town of Drohobych, most of whose 15,000 Jews were murdered. The park stands on the site of the town’s former Jewish ghetto, but there is not so much as a plaque in the park to memorialize the Jewish dead. This and other examples like it make a condemnation of Yushchenko’s step necessary. Ukrainian sources confirmed that “fighting people in the homeland … [were] not prepared to accept [Bandera] as a dictator,” and that Bandera’s program “was unacceptable to the resistance movement inside [Ukraine].” In 1952 Bandera temporarily resigned as head of the OUN, pressured “by the growing opposition to his leadership among … top-ranking nationalist leaders who opposed him on the grounds of his totalitarian tactics….” Bandera’s subsequent petulance and his insistence on directing all facets of the Ukrainian underground at home and abroad led the British to drop him in 1953. With no high level contacts to listen to him, Bandera was now on the outside looking in. Owing to his self-promotion in print and on West German radio, Bandera remained popular with thousands of Ukrainian émigrés in West Germany. His superficial effectiveness prompted West German intelligence (the BND) to establish contact in 1956. By 1959 the BND was helping Bandera to run a new generation of Ukrainian agents from West Germany into the USSR. General Reinhard Gehlen, the head of the BND, had lead German Army intelligence in the USSR during the war. He and his subordinates were surely familiar with Bandera’s wartime record. They were less familiar with the fact that the BND was by now thoroughly penetrated with Soviet agents. On October 14, 1959, Bandera had lunch with senior BND officials to discuss the expansion of operations in Ukraine. The next day the KGB assassinated Bandera in his apartment building. Because Bandera effectively promoted his own legend, and because the Soviets were behind his death, émigrés who did not know any better labeled him as the martyred leader of Ukrainians abroad. Fifteen hundred attended his funeral in Munich. US officials, on the other hand, noted that Bandera’s “strong arm tactics” and “competition with other émigré groups” meant that “many émigré figures clearly do not personally lament his passing.” His death meant nothing for CIA operations against Soviet rule in Ukraine, which depended on the very same émigré leaders who, though followers of Bandera during the war, had dumped their former chief as a self-promoting caricature. They continued their work under CIA tutelage until the USSR collapsed. Such is another story. It is a sad comment on Ukrainian memory that the man declared a Hero of Ukraine in January headed a movement that was deeply involved in the Holocaust. It is more gratifying to know that by the time of Stepan Bandera’s death, most Ukrainian leaders had long rejected him as a dangerous charlatan who harmed his own cause. By the time of his death, Bandera was reduced to dancing with the Cold War’s most compromised intelligence agency, where the Soviets could watch his every move. Those who label him a hero today, in other words, are as foolish as they are offensive. 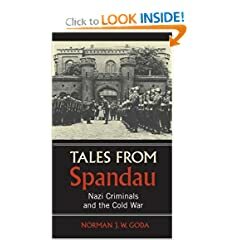 Soviet Chief Prosecutor at the Nuremberg trials Roman Rudenko, in his accusatory instruments against Nazi collaborators, did not mention Stepan Bandera or the Organization of Ukrainian Nationalists despite, one can be certain, a definite agenda drafted in the Kremlin itself. The preeminent Jewish historian on the Holocaust Raul Hilberg in his seminal work “The Destruction of the European Jews” does not mention Bandera or the OUN either. It’s true that Yad Vashen was not pleased with Raul Hilberg but not because he was not accurate but because he failed to embellish upon Jewish heroism. Prosecutor Rudenko certainly had access to Soviet archives. Professor Hilberg based his work primarily on German archives. Jewish survivors’ eyewitness accounts were compiled by the Jewish Historical Institute in Krakow in 1945 immediately after the war with no impugning of Bandera and the OUN. What is being offered as “new evidence” today isn’t really evidence at all. The unfortunate characteristic of this recent Holocaust historiography is that as time passes and memories fade, Holocaust “experts” feel compelled to find new demons. They cease to be historians and become political witch hunters. Askold S. Lozynskyj, the son of an Auschwitz survivor, is a New York attorney and past President of the Ukrainian World Congress. One crime does not excuse another. Dear Gentlemen! I consider myself blessed with great fortune that I have been witness to such significant discoveries of INTERNET! Do You do News Articles - Timeline in Google? Please do Google"I Was a Communist Agitator By an on ex-member of the Party . A Frank and Startling Disclosure of the Inner Workings of Communist Party in Canada"
It was publish in Nov-Dec 1936 "The Evening Citizen" Ottawa Ont. Canada in 18 installments. Krivitsky, Walter G. " In Stalin's Secret Service: Memoirs of the First Soviet Master Spy to Defect." Victor Kravchenko "I chose freedom"
Victor Kravchenko "I chose justice"
You with Your "dirty mind"- anti semi-OH NO! "Kremlin wall of fame list", Sorry! How in the world do highly educated and religious people/some of them slave owners/ can commit such crimes. Yuriy Shukhevych was murder by NKVD and seven thousand Ukrainians in Lviv Brygidki Prison day before of Nazi invasion. Dear Elliott, You may think that convicted killer Mikhail Markhasev and businessman and philanthropist Andrew Mogilyansky is Ukrainians to,I am very SORRY! PS. Do You wont the good one? Nice people are not appreciated as they should be, often they are taken for granted and their respect level gets lowered. once their level of respect goes down, they're most often over looked. Arnold, for examples of Arafat-PLO massacring of Arabs, you could read back issues of the press, maybe the French LeFigaro, the Italian Corriere della Sera, and other more informative papers [the NYTimes may have omitted much of the news that I am talking about], etc. Maybe even the Philadelphia Inquirer carried the news that I have in mind. Go back to the end of July-beginning of August 1978 and you will see in reliable and informative newspapers that internecine conflicts within the PLO in Lebanon, between different factions, killed several hundred up to a thousand or more Arabs, mainly Palestinian Arabs, just in a period of three weeks before and after August 1, 1978. Next, google "Damour massacre PLO arafat". See what comes up. The Arabic-speaking Christian inhabitants of Damour in Lebanon were slaughtered and driven out of their homes by PLO armed forces under arafat command. There were other massacres of Arabs by PLO forces under arafat's command in Lebanon but it would be tedious to list them all. I don't avoid anything, the same as I have already shown you that I didn't forget anything relevant to the issue in question. So, if you're correct, then he is a mass-murderer. I do mention US and its NATO allies. Oh, surely, all those regular occasions are just "tragic mistakes"
"shielding" themselves with civilians, made with no inflicting terror in mind. The latter just a prerogative of bad guys/states, i.e. our official enemies. As far as your critic of Israel is concerned, let me guess what it mainly is: you would (as I recall from some of your previous comments on other articles) criticize Israeli goverments for not dealing with Palestinians and Arabs, in general, more forcefully (which, of course, in your political tongue would mean just "differently") than they did in the past and present. Prove me that I'm wrong on this last issue. disappearance of young Jews during the fascist regime of black colonels (sponsored and heavily supported by the US), the lads whose fate their Jewish mothers were trying to find about for decades since their "mysterious" disappearance. Lenin and Stalin as well, you say. Stalin was another mass murderer. Consider all the people involved in Jewish culture and all the Zionists that he sent to labor camps. Consider all the Jews that Stalin had killed. You can't admit any moral failing on the part of Bolsheviks/Communists. Arnold, you didn't answer my question about arafat. Anyhow, if you want me to criticize the Israeli govt, I can do that quite well, I believe. I could go on at length with such criticisms, although they might not be the criticisms that you would make. As to Latvia and Estonia, Ephraim Zuroff, an Israeli, often has criticized Latvia and Lithuania. I believe that the Yad vaShem institution has too although I cannot refer to press reports. Be that as it may, I am waiting for you to admit that arafat was a mass murderer, more of Arabs than of Jews to be sure. Can you stop avoiding an answer by counter-attacking me without knowing what my positions on the questions on which you attack me are really my positions?? I just want to add to my previous comment: as well, as Stalin. brief explanation of the predominant role of Jews among early Soviet communists, i.e. Bolsheviks. with candidates of other nationality. Mr.Green, who told you that I don't recognize Judeophobia (as well as ANY other form of racism and chauvinism, including Jewish one) when it is REAL, not pinned on any person who ever criticizes Israel, as many of my Jewish opponents on this site, you inclusive, regularly do? But this just the answer to your misrepresentation of my views on the issue in question. of Israel and the West in that regard. What is your evaluation of that silence? Don't you recognize that viewed on that background the accusations against some critical remarks (often occasional) and statements of the political leaders, journalists, historians, and celebraties of all sorts, in general friends of the Jewish nation, towards Israeli government are too loudly protested against and too harshly condemned by the absolute majority of Jewish organizations, prominent Zionists, and most US and Israeli mass-media outlets, instead of being accepted as constructive criticism and debated? Don't you also recognize that such a wholesale adversarial response, adds fuel to a flame of Judeophobia, which according to yourself is blazing anew around the world? Arnold, we agree that Bandera was a murderer. Why can't you agree that arafat was a murderer. As a matter of fact, he killed more Arabs than Jews, just as Saddam Hussein killed more Arabs than Jews. But if either had had the chance he would have killed as many Jews as Hitler. Judeophobic fantasies and paranoia, religious hatred of Jews going back to Muhammad, renewed Islamic hatred of Jews and adaptations of Western and Nazi Judeophobia are all commonplace in Arab cultural and religious life and mass media today. Why can't you recognize that the Judeophobia commonly peddled in the Arab world today much resembles the Judeophobia of the Nazis? Why so many Jews were members of the communist party? Why not? The Jews are normal people and after centuries of pogroms and persecutions by Ukrainians, Poles and Russians, some of them felt that it's the only way out. The renowned British historian Paul Johnson in his "A history of the Jews" calls them "Non-Jewish Jews" (like Trotsky). The "good" Ukrainians killed many thousands of Jews not only the communists. The famous Jew hater David Duke got his PhD in "Jew hating studies" in Ukraine (where else). The hatred of Jews is an integral part of the history of Ukraine and even the most cherished characteristics of the fight for independence and freedom, in Ukraine, are stained by hatred of Jews and pogroms. There are very few exceptions but in general the Ukrainians hate Jews and liked very much to kill as many Jews as possible and also liked to beat them and steal Jewish property. First of all, why I don't hear screams of furious condemnation from you, Mr. Green and other main procurators of this site of any even innocent criticism of Israel and the Jews, when here we have a case of genocidal anti-semite, not just any anti-semite? And I don't forget a single thing, sir. However, equalizing political and strategic MISTAKES/MISCALCULATIONS of Stalin and some Western leaders to collaboration with Nazis would be a great stretch of ideological fancy and distortion of historical content. did the Soviets had the same imperialistic, colonizing and genocidal goals in mind, as the Nazis had? WWII by saying that if the issue was the saviour of British nation from Nazis he would not hesitate to make a deal with Devil himself, and he made it with Stalin, as made the US. So why would we grant Churchill and the US a lot of slack on that deal, but refuse to do it for Soviets/Stalin, who, as it is well-known, happened to be at the time in much worse position facing hords of Arian people one on one. fight communists. But while fighting the latter he would kill unarmed Jews, Ukranians, and Russians, which actions made him a terrorist and genocidal murderer, not a freedom fighter, the same way, as Osama bin Laden and his bloody gangs have never been freedom fighters (as they were called in the West... when they would kill Russian soldiers and non-soldiers along peaceful Afghanis who sympathized with Kabul's regime that time. "Our S.O.B." is still S.O.B., and no double standards so beloved in the West (and - therefore - by Yushenko and his rare supporters) are going to change this historical resume. Again, Mr. Green, I cannot imagine that had Russian President officially proclaimed some Jewish hater (not already mentioning mass-murderer of Jews) a Hero of Russia, Israeli officials, many Jewish organizations worldwide and Western leaders along with mass-media would not noisily protest and condemn that act of obvious insult to the memory of victims of anti-semitism. Yes, Archbishop Sheptytsky saved Jews. But, Vito, western Ukraine was under Poland from 1930 to 1939. What does that have to do with the Communists? Far be it from me to defend Communists, but let's accuse them of what can be reasonably attributed to them. It seems a non sequitur to go from persecutions of Ukrainians in Poland to "Boss" J Stalin. Arnold, yes, Bandera was loathesome and hateful. But you forget that Stalin and the Bolsheviks/Communists allied with Hitler to bring the world WW2. Yes, I know that Chamberlain of the UK helped Hitler take over Czechoslovakia. But Stalin helped him take over Poland in 1939, actually sharing Poland with him [that is, the USSR took over eastern Poland which was made up of western Belarus and western Ukraine]. So the Stalin, the Communists, and the USSR, as well as the Western phoneys like Chamberlain, all helped Hitler get into a good starting position for the war. Do you deny Stalin's Nazi collaboration, Arnold? vito has kindly furnished a set of links to the very authoritative and reliable wikipedia [?] of Soviet officials involved in oppressing the population, including Jews and Ukrainians. It seems that Vito took care to produce a list mostly made up of Jews. Bukharin, Rykov, Beria and Dzerzhinsky were not, although Vito may think that they are. Maybe one or two of the others are not Jews either but Vito seems to share Bandera's viewpoint. The first four on his list were Jews. It's nice to know that some people don't forget. We should not either. Talk about collective guilt and collective punishment. Professor of Holocaust Studies, Please a little bit of history not only "HATE ALL UKRAINIANS".What is You hiding?? ?KOMZET ,OZET, JDC, ORT-colonization of Ukraine and Crimea???? Crimean Tatars deportation-1924 and 1943 -JDC??? ?How many Ukrainians died from the hands of Trotsky, Stalin, Bukharin, Zinoviev, Kamenev, Rykov, Tomsky, Postyshev, Blumkin, Yagoda, Orlov, Beria and many more Your "HEROES OF RUSSIA" with the graves next to KREMLIN WALL. I don't see name S.Bandera on Molotov -Ribbentrop pact and the Munich Pact??? Can they justify mass trials and executions of Ukrainians in Poland, particularly youths from 1930-1939. Working for new "BOSS" J. Stalin, killing thousands and housands Ukrainians from 1939-1941.according Slawomir Kalbarczyk the June 1941 evacuation of all Soviet prisons claimend anywhere from 50,000 to 100,000 victims mostly Ukrainians and small group of Jews.In Brygidkah 10,000 dead Ukrainians, Stanislaw-15,000,Ternopil-18,000, Striy-1500, Bibrka-500, and the list go on and on June 1941 ??? Did Roman Shukhevych brother Yuri was murdered at Lviv's Bryhidka Prison in 1941 by NKVD???? Who You trying to fool-"PROFFESSOR"? How many waffen ss was in German army? ROA- army, not a battalion and all RUSSIANS,Blue Police...http://en.wikipedia.org/wiki/List_of_Waffen-SS_units???? Operation Wis&#322;a,Mr PROFFESSOR- The code name of the military operation, by Polish military and security units (28 April to 31 July 1947), that resulted in the deportation of 150,000 Ukrainians from their autochthonous territories (the Lemko region, Sian region, and Kholm region) in southeastern Poland to Poland's ‘regained territories’ (Ziemie Odzyskane), newly acquired from Germany, in the north and northwest. depredations and deportations to the Soviet slave labor camps. Please act like Professor- not PROFFESSOR!!! How about apologizing for promoting obvious falsification of present Ukranian government (that makes every possible move to instill hatred between Ukranians and Russians) on behalf of Bandera, clearing the latter and his bandits of the genocide against Jews and terrorist acts against other civilians - Ukranians and Russians - just because they supported Soviet regime, regardless how bad it was? "“We will lay your heads at Hitler’s feet,” a Banderist pamphlet proclaimed to Ukrainian Jews."? Do you refuse to acknowledge that evidence as well? nationalistic terrorist A Hero of that country?! It is a paramount of duplicity on one hand and Ukranian chauvinism on the other! Stepan Bandera was as bad a terrorist, as any anti-US terrorists that are called "monsters" by American officials and mass-media today..., but he was "our terrorist", and our terrorists are forever named "freedom fighters". Thus, it has come as no surprise to any shrewd political observer that American puppet, and perhaps, even most precious intelligence "asset"
and finances and driven Ukraine nation to bankruptcy) declared that genocidal bandit, whose gangs terrorized not just Jews, but Ukranians and Russians (who fought against Nazis), a Hero of Ukraine. But since the Yushenko's move is purely political one designed just to further aggravate Ukranian-Russian relations it is OK, and the history itself can be ignored - or better - scorned. In February 2008, the Ukrainian Security Services (SBU) archive representative Oleksander Ishchuk showed declassified documents, which provide an objective basis to state that OUN (the Organization of Ukrainian Nationalists is not connected with any violent actions against the civil population of Lviv on or after July 4, 1941. The declassified documents of SBU indicate that on July 4-7 of 1941, representatives of Gestapo, who arrived in Lviv, turned to the Ukrainian population inciting them to carry out an anti-Jewish pogrom. "The OUN leadership, having got to know about that, informed its members that it was a German provocation in order to compromise Ukrainians with massacres", the document reads. Prior to the German invasion, the Soviet NKVD, in which Jews had disproportionate membership, was involved in the killing of 4,000 to 8,000 civilian prisoners — a fact the Nazis hoped would provoke Ukrainian retaliation. Furthermore, while the Israeli Holocaust Museum Yad Vashem has also attempted to pin the Lviv Massacres on Ukrainians, especially Roman Shukhevych, leader of the Nachtigall batallion and later the anti-Nazi, anti-Soviet Ukrainian Insurgent Army (UPA), the head of the Association of Jewish Communities and Organizations of Ukraine, Vaad Yosyp Zisels, asked Yad Vashem for documentary evidence to prove that claim and was unable to obtain it. In a January 27 story posted on the web site of the Religious Information Service of Ukraine, which is run by the Ukrainian Catholic University, with which the Canadian Institute of Ukrainian Studies at the University of Alberta, cooperates, it was noted that this proves the accusations against Shukhevych are “groundless”. Vaad Yosyp Zisels also called upon Ukrainians and Jews to give up the accusations and focus on developing new, harmonious relations. “If we, the Jews, continue to count how many Ukrainians collaborated with the Nazis and the Ukrainians continue to count how many Jews served in Cheka, GPU, NKVD, and KGB, we will forever stay in historical impasse where conflicts could easily erupt,” noted Zisels. Don't know anything about the man, but I imagine the reaction of the Ukranians had more to do with Stalin's attacks on them in the thirties. Also as I understand it because of those attacks, theNazi's were welcomed with open arms.